Teach your students to write code and apply the Engineering Design Process using robots! This sustainable program provides reusable equipment, software, standards-aligned curriculum and professional development opportunities to enable you to teach your students to write code and cover engineering design standards. The hands-on activities focus on improving computational thinking skills and promoting mastery of concepts. The program culminates in one-day public events where students showcase their robot designs and solutions. Participation is open to Pre-K through 12th grade students. Public schools, home schools, private schools, charter schools, community organizations, church groups, and interested parents are all welcome to participate. The kit is $575 with registration, which includes all equipment, software, curriculum and activity mats. It contains everything you will need with the exception of a computer. You will have an annual registration fee of $75 per team. Challenge events may have a small entry fee for participation. How much of a time commitment will this require? The curriculum has short easy to follow lessons that build the student’s skill set. The amount of time you spend is dependent upon the goals you have for the students learning. Teams that participated in the program this past year put in an average of ~2 hours per week for a six week period and were very successful. What prerequisite knowledge do teachers and participants need? You do not need any prior experience with programming or engineering design concepts! What skills will my students learn by participating? Participants will learn how to write code in the C programming language. Learning to code improves computational thinking skills and problem solving, which both relate to improved math performance and problem solving skills. Students will also get real-life direct applications of the engineering design process. Participants gain valuable practice with; Critical Thinking, Decision Making, Collaboration, Analytical Skills, Adaptive Learning/Flexibility, Creativity/Innovation and Communication. 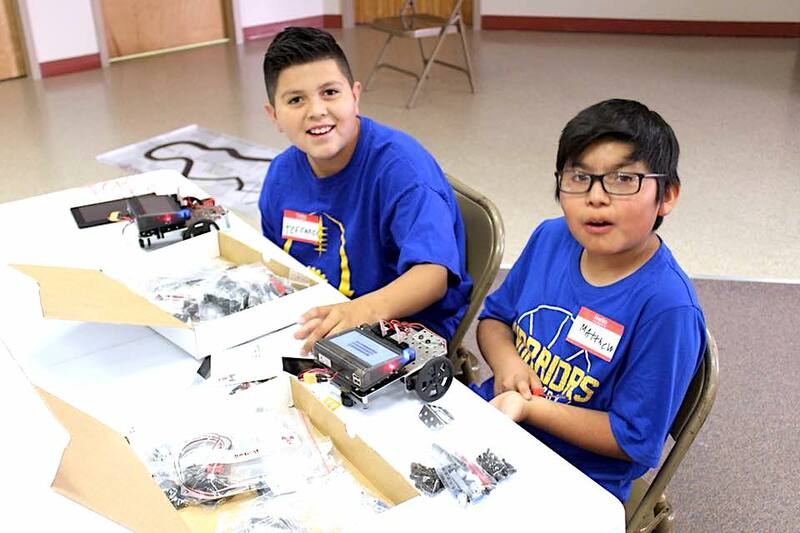 The Junior Botball® Challenge registration is good for one program year: August 1st – July 31st. You can register and get started anytime, however to get the most out of the program we recommend registering close to August 1st! Your yearly registration fee of $75 allows you to participate in any open events (workshops and challenge days) until July 31st of the program year in which you registered. You can add anything you want to the kit (foam board, cardboard, popsicle sticks, etc.) to help with engineering design ideas. How many kids can use one kit? The memory on the kit can store thousands of programs so numerous kids can use the same kit. This helps with budgeting and getting started- you can start with one and then add kits in subsequent years. In a perfect world you should have one kit for every 3-4 students. The technology allows up to 5 students to simultaneously program the same robot! Grab one here! Yes, you can use the kits again and again year after year. This makes your yearly cost of participation $75 and whatever entry fees you may have for individual challenge events. Where do I get a kit? You order the kit directly from us (KISS Institute for Practical Robotics) here or you can use any other autonomous kit that you already have. Remember the curriculum covers the use of our kit only, however the challenges and activities can be completed with any programmable robot platform. We will ship the kit directly to you and if you plan to attend a professional development workshop, you will need to order your kit with enough lead-time to receive it prior to that event. What if I already have some robots, can I use other robot platforms? Yes, you can use any other robot platform as long as it is operating in autonomous mode (NO remote control). You will need to purchase the activity mats, which you can find on our online store. Our software runs on any computer, tablet, or device with a web browser and a wifi connection. Are curriculum and training available? Your $75 yearly registration fee provides you access to the online curriculum and challenge rules. We strongly suggest that all new teams attend a workshop, which you can find listed under the events page. Do I have to participate in the challenges or can I just use the kit for education? You do not have to participate in any public challenge events. How many different challenge events can we participate in? Once you are registered for the year there is no limit on the number of events that you can participate in. Events will be workshops and challenge events. Challenge events can be open (any registered team can sign up to participate) or closed (closed events are open only to select teams- often this would be used for in-school or district scrimmages). How is this program different from other robot programs/competitions? The program focuses on training and empowerment of teachers so that they can teach their students how to write code and apply the engineering design process in a fun and meaningful way. Students learn through an inquiry-based curriculum that teaches discrete programming skills through challenges that demonstrate mastery of the concept. We use the activities from the curriculum for the challenges at the events. How do other people implement this program? We have seen the program implemented inside the regular classroom, in pull out programs, elective classes, home schools, after school programs, G & T programs, extracurricular clubs and with other community organizations. How many kids can be on one team? There is no limit to the number of students on a team, however at challenge events you can bring a maximum of 3 students up for each challenge. Your yearly registration fee covers August 1st through July 31st of each year. We will host an International Championship every July for any interested teams. You can purchase extra parts from our online store.